7/15/08 Tristraum will play the Vendetta Music Festival October 2/3 in Denver, Colorado. Headliners: Melotron - State of the Union - Minerve - BUY TICKETS HERE - Also playing: Section 44's Sybel and Die Brucke... among others.. We also just finished a remix for Requiem in Black. Look for it on their 2nd album Revolution Nation due out in August 2008. 10/3/07 Tristraum was won the Denver ABC/7News A-list best local band award. Thanks to everyone that voted for Tristraum. See List of Winners here. Thanks to TheDenverChannel for organizing the event. Buy tickets to our only schedule live show in October here. 7/8/07 Tristraum will open for Assemblage 23 on October 20th at Cervantes in Denver, Colorado. www.section44.com for tickets. $15 Advance - 16+ up. New Mexico's Leiahdorus will also join us on stage before A23. In other news, we've been nominated for an ABC Alist award in the Best Local Band category. Please support us with your vote HERE. Thanks. See you all at the show in October. 5/8/07 Tristraum has been nominated for the 2007 Westword Music Showcase in the gothic/industrial genre. Click here to vote for Tristraum. 5/5/07 Our next live show will be at the 2007 Opus Arts Festival in Denver, Colorado. Sat, May 25th. $12 at door for concert/one day pass. See site for details. We'll be opening for Assemblage 23 in Denver in October also. Show is scheduled for Oct 20th. 9/20/06 Our next live show will be at The Bluebird on Oct 2nd, 2006 as part of Dark Mondays Event. Doors just before 7pm. Four bands including Platoon13 and Denver's Datacode Division. $5 at door - This is an all-ages show. 16+ up. See you there. 4/25/06 Our next live show will be at The Shelter Nightclub on May 28th, 2006 as part of the 2006 Colorado Dark Arts Festival. Ten bands and thirteen artists will perform/show. We'll play alongside Eloquent, The Dignity of Labour and November Process to name a few. Our next single "First Embrace" will be available at the show. 2/1/06 Our debut album 'Gray' was released today. The album features ten tracks. Gray holds singles 'Shiver' and 'First Embrace' as well as a Gary Numan cover of 'Walking With Shadows'. Order today at Section 44 or A Different Drum. See MUSIC for complete track list and sound samples of each song. 1/2/06 Our next live show will be at The Church Nightclub on January 29th, 2006. Also appearing: A Different Drum's The Dignity of Labour and Leiahdorus. Doors at 9pm. Free before 10pm. Denver. Our entire album can be previewed now under MUSIC. Our myspace page has been updated with two complete new songs off the album. 11/1/05 The God Project remix of "I'm Under No One" will appear on "Interbreeding VII - The Flesh Harvest". This compilation also holds exclusive tracks from Das Ich, Syrian, Hioctan, Run Level Zero and many more. Order your copy today here. 8/20/05 Babydoll shirts are now available. These are cute American Apparel brand girl's tees. Sizes/Colors: Green: XL, Black: L, Pink: S $18 includes shipping worldwide. Paypal sales@section44.com with size and color. Click here to see a larger photo of shirts. 8/5/05 Tristraum will perform with Dismantled (Metropolis) and Illion Conflict (Denver) on August 16th at 8pm. Rock Island Club - 1614 15th Street, Denver, Colorado. We'll debut a new song "Eyes Wide Open". This will be an all-ages event brought to you by Vendetta Music. 7/21/05 The Amurai Remix of "First Embrace" has been released as part of DJ Coppertop's Live DJ Mix Hysteria. You can order a copy via Storming the Base today. Also appearing on Hysteria: Iris, Rupesh Cartel, Negative Format, Headscan, Nevarakka, Virtual Server, Endanger, Cosmicity, Delobbo and more. A great non-stop dance mix! 7/20/05 Tristraum's remix of Leiahdorus' "Kiss on the Telephone" is now available via A Different Drum. This is the first single from their forthcoming album. Order your copy today. 7/10/05 Another unreleased remix of "First Embrace" appears on the popular series "Advanced Club" from Mexico. The "Amurai" remix appears on Volume 0.2. Other bands that appear on this comp: Iris, Ayria, Neikka RPM, Syrian, Glis, Sero Overdose, Sequentia and Aiborfocen. 7/9/05 An unreleased remix of "First Embrace" appears on "Yet Another Electro Compilation Volume 2". You can download the entire album free at Yet Another Electro Website. There's some great new music on this free compilation. Check it out. Download. Enjoy. 7/8/05 The Dying Beauty MCD is now available via A Different Drum. There's some great remixes and a bonus track on the disc. Chinese Theatre and A23 are among my favorites. Support independent music and order a copy today. 6/13/05 Our remix of James D. Stark's "Dying Beauty" can be downloaded for free at his myspace page. The actual cd will be out in the next few weeks. Order at ADD or Metropolis. Also in the works, remixes for The Dignity of Labour, Nouvelle Culture, ESH and Leiahdorus. 4/4/05 Tristraums will perform at the Colorado Dark Arts Festival in Denver, Colorado May 29th, 2005. Nine bands, fine artists and fashion that showcase Colorado's darker talent. This is an all-day/evening event that takes place at both Rock Island Club and Cafe Netherworld. 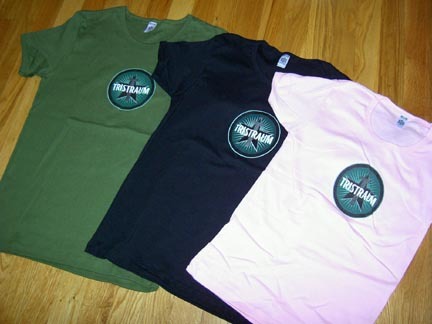 Tristraum T-Shirts are finally back in stock. Available in Black and Grey. Sizes: L, XL and XXL. We only ordered a limited quantity. Order now and wear it proudly... $13.99 Available through Section 44. The older stuff (iron-on) is still available via Cafe-Press. But these screen-printed shirts are much nicer. Better printing. Higher quality. 3/8/05 The Fixx: An Electronic Tribute and ROCKET: A Tribute to Dead or Alive are at the pressing plant. Expect them by the last week in March. Check out both exclusive websites for the projects at: Fixxtribute.com and Doatribute.com Order your copies today! 2/1/05 We have a winner. The "First Embrace" remix contest is over. We have six finalists and one winner. See the remix contest page for details. The winner will appear on "4x4" this March/April. And some of the finalists will appear on future releases throughout the year. A Different Drum in March. You can preorder a copy here. Somegirl has a new female vocalist. Check it out. The single also holds a remix by Estatuas de Sol and two other songs. 1/22/05 Tristraum's second single "First Embrace" will be released as part of the "4X4" multi-band single. The winner of our remix contest will appear on the release as well as two or three Tristraum remixes. The other three bands are The Thought Criminals, Eloquent and Empire State Human. Expect 3-4 songs from each band at a MCD price point. The release will be released by newly created Section 44 Records and Kiss My Asterix Records ( Los Angeles ). Release date: March 2005. 1/6/05 Tristraum's January 27th performance has been moved. The new date will be announced shortly. With luck, we're still playing with Emergence (Denver). Check back. In other news: Section44 Records will release both The Fixx and Dead or Alive tributes. 12/16/04 WXJL "The Best of Future Wave Radio" is now released. And the best part is, you can get a FREE copy jus by ordering anything from A Different Drum's webshop. So, drop by ADD and stock-up on your favorite synthpop tunes. Tristraum's "Shiver" is on the comp. 11/17/04 We're remixing James D. Stark's 'Dying Beauty' Maxi Single in December from his 'Fortress of Solitude' album. The single will also hold remixes from Assemblage 23, Martin Atkins (Underground Inc.) and others to be announced. Release is scheduled for early 2005. 11/14/04 Tristraum is performing JANUARY 27, 2005 with EMERGENCE. The show is at The Wave, 2101 Champa Street, Denver, Colorado. Cover is just $5. After the show, hang around for EBM, Industrial and Gothic sets by DJs Demon and Katastrophy. 11/12/04 We're sponsoring another remix contest. This time, it's to get a slot on our second single 'First Embrace'. You can find all the remix tools located here. Entries are due January 10, 2005. Good luck. Winners will be announced January 30th, 2005. 11/6/04 Color Theory has announced a special release of just the bonus remixes from the Color Theory Presents Depeche Mode album. Our remix of "But Not Tonight" is on the album! It's only $9.99 (includes shipping) and includes 14 remixes/tracks not featured on the original release. Order yours today. 11/2/04 A Different Drum's official bootleg from the 2004 Synthpop Festival is now available. Tristraum's 'Gray' is included from the performance. Bands include The Echoing Green, Leiahdorus, B! Machine, Intuition, Subimage, Jupiter, Voice Industrie, Faith Assembly, Provision, Glow and Eurovision. Order your copy today at ADD. Just $14 !!!! 11/1/04 Here's your first look at our debut album currently titled "Gray". It will hold 13-14 tracks including at least two confirmed guest vocalists including Steven Cochran (Royal Visionaries/Eloquent) and Aidan Casserly (Empire State Human). Also, two unreleased club remixes will be included. See MUSIC for complete track list, etc. 10/6/04 Our remix of Fr/action's "Partners In Crime" is now available for free download to owners of Fr/action's album Last Man Standing. See site for details. Also, just completed: Blind Faith & Envy's "When I Know You're Gone". Release information to follow shortly. BF&E are remixing Tristraum's "I'm Under No One" as well. Also, we've added a full download of "Gray" in our MUSIC section. 9/8/04 Tristraum has forum now located at SlothRadio. Check it out and tune-in. Remix news: Just completed: A remix for A Brand New Day titled "Thinking of You". BND is a side-project of Joe Ramey (Eurovision). Next-up: A Remix for Fr/action and Blind, Faith & Envy. Photos are in from A Different Drum's Synthpop Festival held last weekend in SLC. 8/16/04 'Shiver" is now available on the most popular music download site. iTunes now carries the MCD. You can purchase individual remixes for just .99 each. Also, check-out our MUSIC page. We've added two new remixes completed for Anything Box and Synthetik FM. 7/25/04 Melodies & Structures Volume 2 is now available for order via 4mg Records (Canada). It holds the 'Smoky Mix' of 'Shiver' (from our Vinyl 12" single). Of the three remixes on the 12", this is the only one on compact disc. Enjoy. 7/23/04 'Shiver" is #1 this week on the Amazon downloads charts for Trance and Dance/Pop! We have completed 'Impossible'... a remix for Synthetik FM featuring Aidan Casserly of E.S.H. Also in the the works: A remix for Eurovision. And we're still working hard at finishing our album. 6/21/04 Empire State Human has announced a contest to secure the final place on their 'Rocket: A Tribute to Dead Or Alive' album. All Bands/ Artists/DJ's/Producers are welcome to record either 'Hooked On Love' or 'Black Leather'. The best version of one of these songs will be picked by ESH and featured on the album. Track must be no longer than 3 minutes, 45 seconds in length and each must be recieved by August 15th. The winner will be announced August 20th. Contact: info@empirestatehuman.com • Tristraum will be contributing 'Baby Don't Say Goodbye' to the project. More information on the release to follow. 6/11/04 Electro Culture Magazine's compilation holding the Empire State Human remix of Shiver is now available for just $10. The cd features 17 bands including Color Theory, Empire State Human, Macondo, Intricated, Mona K, Void, Minus Field, In A Sense, Afterchain and more. The Tristraum Store is now open offering a few dozen graphic and logoed items. Three designs to choose from. Men and women's sizes and styles. And don't miss the popular "groupie" thong! Order your stuff today and wear it well. We're remixing a song from the new Fr/action album this summer. Also look for a Fr/action contribution to the forthcoming album: The Fixx: An Electronic Tribute. 5/21/04 Tristraum is producing an album tribute to The Fixx. Music styles include synthpop, darkwave, ebm, electro and futurepop. Bands interested in contributing should send us an email. More information to follow as it becomes available. This release is schedule for Winter 2004. We've set-up a web page for the release. Check it for updates. 5/17/04 The Lime N Dale remix of Shiver has reached the #2 positions on Amazon's Trance and Dance charts. Download it today for free. Also, don't miss the second download on Amazon. The unreleased Signify remix of Shiver! Here's the link to get your copy. 5/12/04 Krystyna will be performing with her band Vellocet Sunday, May 30th as part of the Colorado Dark Arts Festival. The event will be held at The Church, Rock Island and Cafe Netherworld. 14 Bands, 42 artists, 25 djs, 7 performances, 7 films and 6 fashion shows. See site for info. 5/10/04 Aidan Casserly of Empire State Human and Tristraum have composed a new song titled "17". It will be featured on our debut album later this year. Look for some trance remixes of the track later this summer. 5/4/04 We're currently remixing "I Know Goodbye" for MODyssey. In addition, Krystyna has recorded vocals for "Gray", an new song from MODyssey off their forthcoming cd. MODyssey will be providing vocals for a Tristraum song for our upcoming album. Busy busy! 4/19/04 The Empire State Human Remix of Shiver will appear on Electroculture Magazine's upcoming compilation. The cd will feature 16 bands including Color Theory, Empire State Human, Macondo, Intricated, Mona K, Void, Minus Field, In A Sense, Afterchain and more. 4/11/04 Shiver will appear on Dark Horizons (Florida) compilation "Nights Lament". You can pick-up a copy of this great 2-disc CD by making a donation to help fund the radio station. See their website for details. Help support your scene today! A Different Drum, Music Non Stop, Amazon & CD Baby. Click on link above to order. Side-Line is featuring an interview with the band in their current issue. Order your copy today. We've uploaded an exclusive SIGNIFY remix of Shiver on Amazon for free downloading. It can't be found on the MCD. Get it while it's still up! 4/6/03 The Missing Link Remix of Shiver from our vinyl release will be featured on Melodies & Structures Volume 2 CD (4mg Records/Canada). Release info to follow shortly. This is the only way to buy this mix on CD. 4/3/03 Our first single "Brilliant" from "This Is Not The End Of Love - A Tribute To Boytronic" is sold-out. Since we had so many requests for it, we've included the song as a bonus track on our SHIVER MCD. Order your copy today. Intrapop Music (Germany). A Different Drum (USA). 3/26/04 The vinyl 12" of Shiver is finally off to the pressing plant. It will hold three remixes not found on the MCD. Styles range from breaks to tech house. It will be available traditionally and through beatport (digitial downloads). We've just added a review page for the both releases. Mile High House (Denver) with an April 20th release date. 1/28/04 Our remix of "Time" by Equatronic is available for order on the Intrapop webshop. The track is part of the "Best of Equatronic-Remixed" album. It has remixes from Wave In Head, Dynamic Masters, Neuropa, Northern Electric, Polaroy, Pearls of Dew and many more. 1/2/04 An independent short film titled "Rock On" will feature Tristraum's "Shiver" and two remixes "Document" (Assemblage 23) and "Dominatricks" (Spanky) during a club scene. The movie will debut in Los Angeles this May. We'll post a clip of the movie when it's available. 1/1/04 First off... Happy New Year! Look for new Tristraum songs in the new year and a load of remixes. Now... for the first remix of the year... Anything Box's "Clean" and we're speeding it up to 122 bpm for the dancefloor.